Tyndall Park is pleased to offer the following horses for sale. 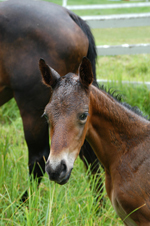 For more information on any of these fine horses, please contact Tyndall Park at 250-833-0100. Note mare is also for sale. Top bloodlines, excellent conformation, very friendly. 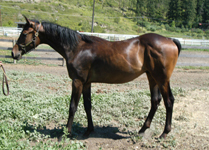 Broadway Star's sire, Be A Grand Star, is a well known Dutch Warmblood stallion standing at Colts Unlimited in Wyoming. His list of achievements in the jumper ring is outstanding. 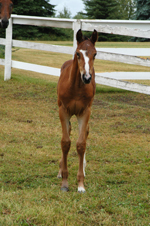 Super bloodlines, excellent conformation, quiet and friendly. 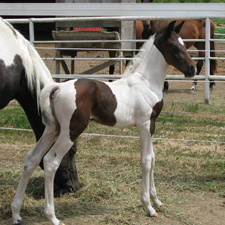 Top bloodlines, excellent conformation. Note mare is also for sale. Sloan has an impressive career under his belt, competing successfully in 4'+ jumpers back in the 90s, baby-sitting beginner jumpers in the early 00s, and more recently as a lesson horse at Tyndall Park. He is easy to catch, has good ground manners, bathes, clips, and knows his way to (and over) a jump. Sloan was sold in Januarly 2009, and has moved back to Sherwood Park. Stonewall is easily the all-time favorite of the many horses owned by Tyndall Park over the years. 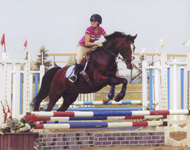 In the last few years, he has been leased to intermediate riders, and has taken good care of them through numerous hunter/jumper shows around Alberta. He is very sturdy, and hasn't taken a day off for any reason in the 8 years we've owned him. 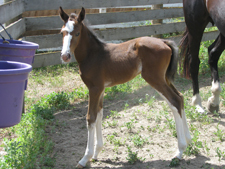 Zoey TP has terrific pedigree, full sister to Zodiak's Magic. She promises to mature into a star performer. 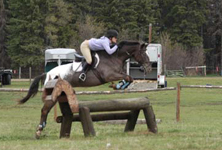 Fire N Rein loves jumping courses, and is looking for a young rider who wants to excel in the jumper ring. 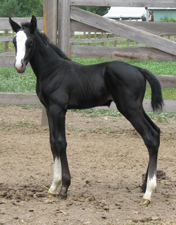 Magic Spell is an eye-catching young mare with a wonderful temperament and lots of athletic ability. 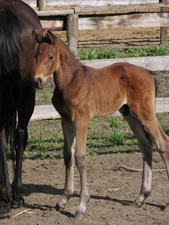 Oldenburg/Thoroughbred cross, dark bay, very elegant with great bloodlines. 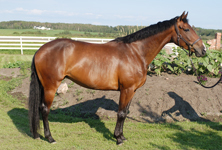 Her sire is FURIOSO III, an approved Oldenburg stallion in the main stud book. Her dam is MAGIC ALOHA, who raced for 8 years successfully and retired sound. She is very correct, has a super work ethic, and excellent ground manners. Her lateral work is very good, she has flawless changes and has shown in the 3ft6 classes with the scope to go higher. Would suit a junior or adult amateur looking for an equitation or show ring hunter. MAGIC SPELL is for sale with a full set of clean x-rays completed in Oct. 2001 and a clean bill of health. 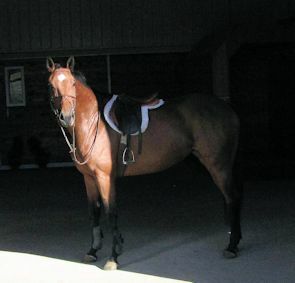 Luxardo TP (Kramer) is a very willing, honest and athletic young gelding. 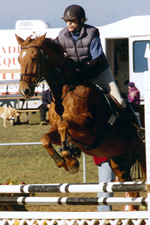 He was unflappable at local schooling hunter shows in the Summer of 2001. Luxardo is an excellent prospect for 3-day eventing..
Zodiak's Magic TP (Monkey) has it all. He's a beautiful dark bay with an even temperament, and lots of energy. Superb movement, very athletic. Excellent jumper or dressage prospect. Fury's Kiss TP (Cowboy) is a fine looking young chestnut gelding. The cross between Furioso and Kiss-and-Tell has proven very successful over the years.